Once upon a time, there was a storybook themed boy’s baby shower. It was full of cute and clever ideas straight from the pages of their favorite children’s books. 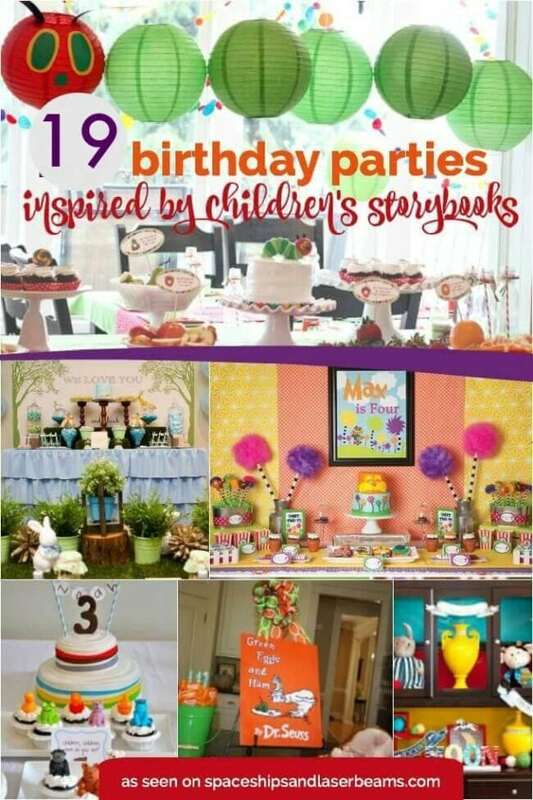 Using passages from each book for inspiration, the food, a diaper cake and colorful shower decorations were all chosen with these favorites in mind. Find a comfortable chair as you follow along for one imaginative, page-turning baby shower. Guests will love these baby shower games and activities. You’ll love the adventurous tone in this modern world traveler themed boy baby shower. To set the stage for their book themed shower, guests were sent a darling enclosure card and invitation designed by Lily Grove Designs. Party goers were invited to forego a card and bring a book for the baby instead. Aren’t the little onesies so cute? Inspired by the cute onesie designs on the invitation, Leigh Ann hung sweet custom onesies on a clothesline as part of the party décor. I love that each was labeled with “chapter 1” and “chapter 2” instead of the traditional, “one month”, “two month” and so on. I adore children’s literature and love the books around which Leigh Ann and her friend designed the refreshment table. A bright, festive and (according to Leigh Ann) easy, inexpensive backdrop was created using hand punched polka dots and craft paper. The dramatic backdrop was created with paper rosettes made from pages of a book and a no sew book page pennant banner. The backdrop really helped unite the various books and reinforce the baby shower theme. Created by Leigh Ann, the diaper cake was definitely a highlight of the refreshment table and also a wonderful gift for the mother-to-be. I love how Dr. Seuss books were tucked in the different layers, adding to the storybook baby shower concept. Leigh Ann had a lot of fun with the menu! Each item was chosen specifically to coordinate with a children’s book. The inspirational books chosen were some of Leigh Ann’s favorites from when she read to her children. The first book incorporated was If You Give a Mouse a Cookie, by Laura Numeroff. A jar of delicious looking chocolate chip cookies was filled for guests to enjoy. There were also adorably decorated mice sugar cookies. I love how each food offering was accompanied by a copy of the book, a printed food label and sweet display items. Next up was the book, Blueberries for Sal, by Robert McCloskey. Leigh Ann served blueberry and raspberry fruit crisp in individual Mason jars. Are you drooling like I am? I love how the Mason jars are given height atop a cake stand made even taller by way of a stack of vintage books. You can’t include Judi Barrett’s book, Cloudy with a Chance of Meatballs and not serve meatballs! Leigh Ann made gluten free, honey balsamic meatballs. They sound and look amazing. The Very Hungry Caterpillar, by Eric Carle is another favorite book with kids and adults. To represent this book, Leigh Ann prepared fresh fruit kabobs to look just like caterpillars. Finally, the last book used was the classic Green Eggs and Ham by Dr. Seuss. Hawaiian ham and cheese sandwiches were a delicious offering that coordinated with this book. A few additional enticing treats were also served up for shower guests to enjoy. Darling cupcakes with edible duckies looked cute in their striped cupcake wrappers. When cupcakes are the question, the answer is always yes–at least in my book! Little cups were filled with gummy “book” worms. After all, you have to have bookworms whenever books are present, right? I don’t know about you, but I happen to think this storybook baby shower had a pretty happy ending! What’s not to love about a shower inspired by some of the cutest childrens books around?! Don’t miss the sweet ideas shared in this hot air balloon + elephants boy baby shower.